The map above shows how the Soviet Union thought World War 3 might play out in Europe. The red mushroom clouds represent planned nuclear strikes on cities and targets in central Europe and the blue mushroom clouds represent the anticipated NATO response. 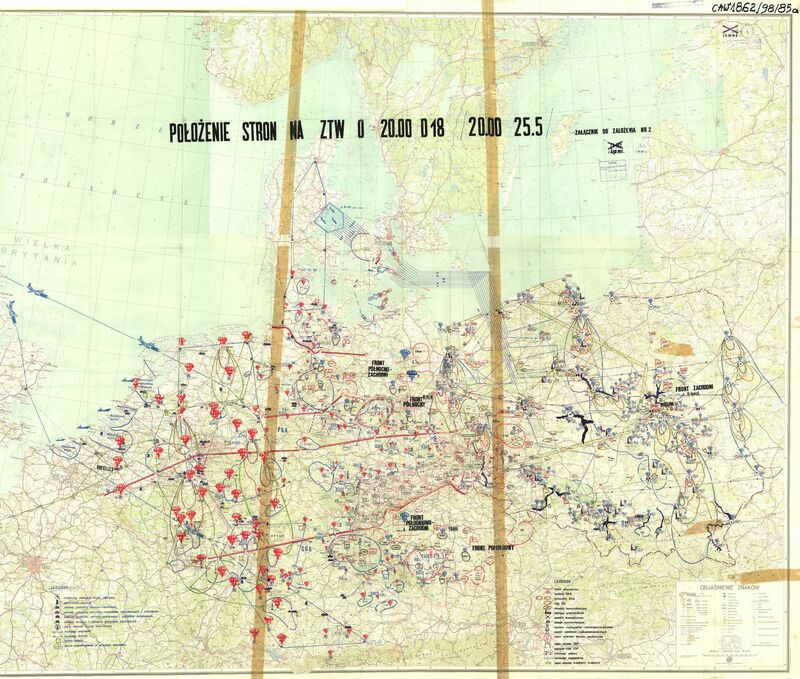 The map was smuggled out by the Polish and delivered to the Americans during the Cold War. It’s based on the premise that NATO ground forces strike first and that the USSR would use its nuclear arsenal to halt, or at least slow their advance. Thankfully this scenario never happened, but it’s a reminder just how close Europe and the World were to total nuclear annihilation, just one generation ago. What was rough date of issue? I was with a tactical nuke outfit outside of Frankfurt in 1963/4. Our job was to stuff them at the Fulda Gap but our expected unit life was measured in minutes. ..black sedans tracked our every movement. I did not see any blue clouds where I expect they expected them? Maybe this was pre-ground assault.. I am glad I missed the opportunity to arm our missiles. Yap Russian map in polish language. Idiotic propaganda. This is a Polish cold war era wargaming map. The whole “7 days to the Rhine” scenario doesn’t mesh with actual RSFSR war plans which were much more conservative. Like Soyus-75 and later variants which depict methodical operational plans with only limited use of WMDs and always as counter aggression.